Arriving in style. Glacier Bay Lodge. Mt. Roberts Tramway above Juneau. Getting there: Alaska Airlines operates one flight daily to Gustavus, the gateway to Glacier Bay National Park. In the most unusual flight experience we’ve ever had, we boarded a 737 with fewer than 20 passengers for a 13-minute flight that topped out at 4,000 feet. We descended stairs directly onto the tarmac and picked up our luggage without going indoors. It felt like a private jet, normal air travel is ruined forever. The only other way to arrive is by boat. 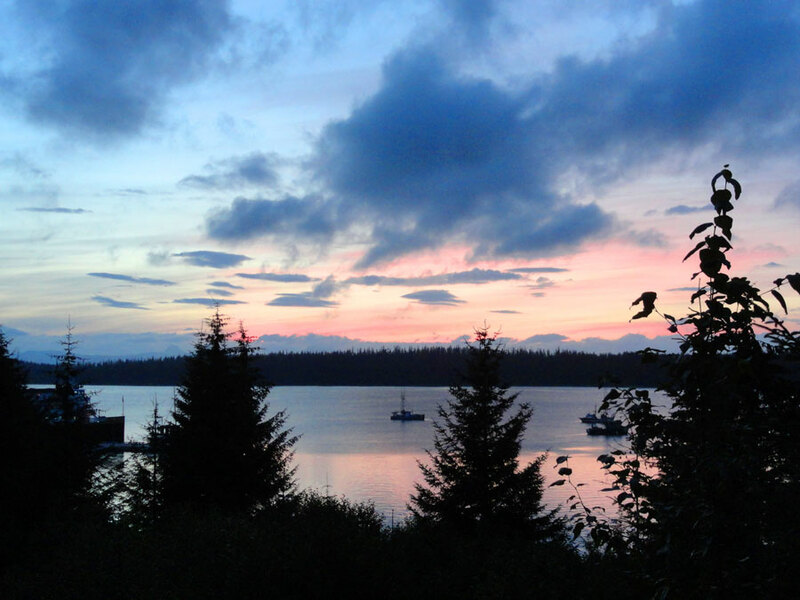 We used the Alaska Marine Highway system with twice-weekly ferry service to/from Juneau. Cruise ships and charter boats can also get you access to the park. Either way you arrive, shuttles will deliver you to the lodge/visitor center 10 miles away in Bartlett Cove. 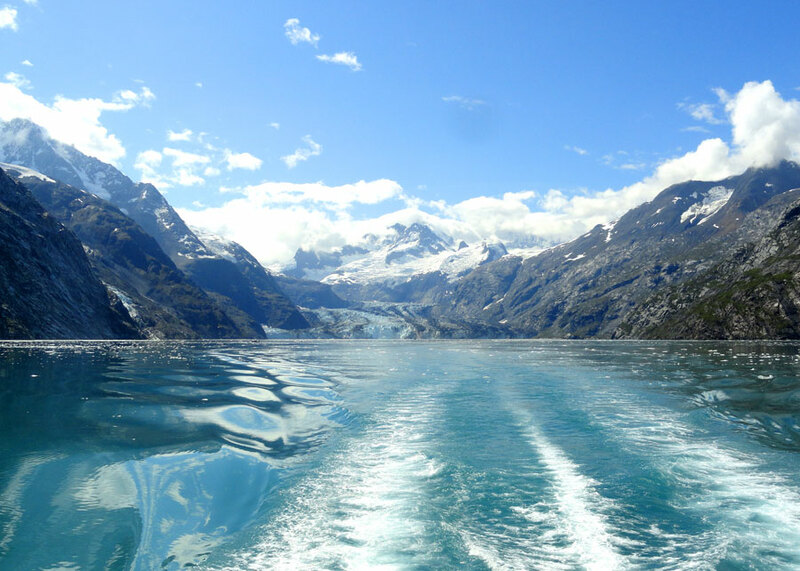 Glacier Bay National Park preserves 3.3 million acres of mountains, glaciers, rainforest and deep fjords. Just 250 years ago the entire area was filled with a massive tidewater glacier that had advanced during the “Little Ice Age” between 1550 and 1850. By the time John Muir arrived in 1879 it had pulled back 40 miles. Currently it has retreated 65 miles up into its gorge, exposing new land as it goes and providing the perfect location for scientists to witness the process of plant succession. The small remnants of that enormous glacier can now be seen flowing down from mountaintops into the water of Glacier Bay. The park is like a living lab for climate change, with some glaciers retreating still further, while a few others (mostly on the West side of the park) are holding steady or advancing. On board the Baranof Wind in Johns Hopkins Inlet. Since the park is primarily made up of water, almost all visitors see the park from a boat. Giant cruise ships can come into the bay on a limited basis, but the best way to experience the park is the daily 8-hour wildlife and glacier watching boat cruise. Once a day during summer the Baranof Wind cruises 65 miles up into the bay, passing popular animal hangouts and pausing at one of the active glaciers (Johns Hopkins or Margerie depending on the day). On our tour we witnessed humpback whales, brown bears, mountain goats, sea lions, harbor seals, sea otters, countless birds and one napping wolf. Ranger Jeanine provided informative commentary and wildlife spotting duties, while the boat crew kept us caffeinated and fed. One deckhand even fished an iceberg out of the bay so we to could touch the 250 year old glacier ice. For me the best part was when the boat parked near the head of Johns Hopkins glacier. For an hour we drifted silently watching giant chunks of ice calve off the 250-foot high glacier wall. Each piece that fell slammed into the water with enough force that it sounded like thunder and sent waves that rocked the boat a mile away, it was awesome. Hiking opportunities are limited for average guests. There are four easy, flat trails near the main visitor center and lodge at Bartlett Cove. We walked the Forest Trail loop and parts of the Beach, Tlingit and Bartlet River Trails. The rest of the park has no roads or marked trails at all, so unless you’re up to date on your wilderness survival training, venturing into these areas is probably best done with a guide company to handle the logistics. With adequate time and ambition it would be an amazing way to experience the park for serious backpacking, camping and mountaineering. Another popular activity in Glacier Bay is sea kayaking, which we would have loved to do, but the timing didn’t work out. Kayaks can be rented by the day or the half day, or the adventurous can kayak for days and camp along the shore at night. The Baranof Wind sightseeing boat can be arranged to make pickups at remote locations. Sunset reflected on Bartlett Cove from the deck at Glacier Bay Lodge. The Lodge at Glacier Bay is an ideal hotel option because it is the only non-camping lodging within the park and offers all guest services, dining and the visitor center in one central location. The cabins are modern and comfortable with resident porcupines providing entertainment along the connecting boardwalks. The main building houses the restaurant where you will most likely be eating all of your meals. Dinner options were tasty, there is a breakfast buffet in the morning and the back deck is a great spot to have an Alaskan Amber Ale and watch the sun set over the water. Nightly ranger talks in the upstairs auditorium were both informative and entertaining as each ranger presents his or her own program including scientific information as well as personal stories about living and working in Glacier Bay. Fun fact: The town of Gustavus has a population of 400 people and 400 moose. After our two nights in the park it was time for our first voyage on the Alaska Marine Highway, a 5-hour ferry ride from Gustavus to Juneau. Peaceful evening in downtown Juneau. Alaska’s capital city is appropriately quirky. Home to about 32,000 people, it is the 6th smallest state capital in the U.S. and has no road connection to, well… anywhere else. This is becoming a theme in southeast Alaska. 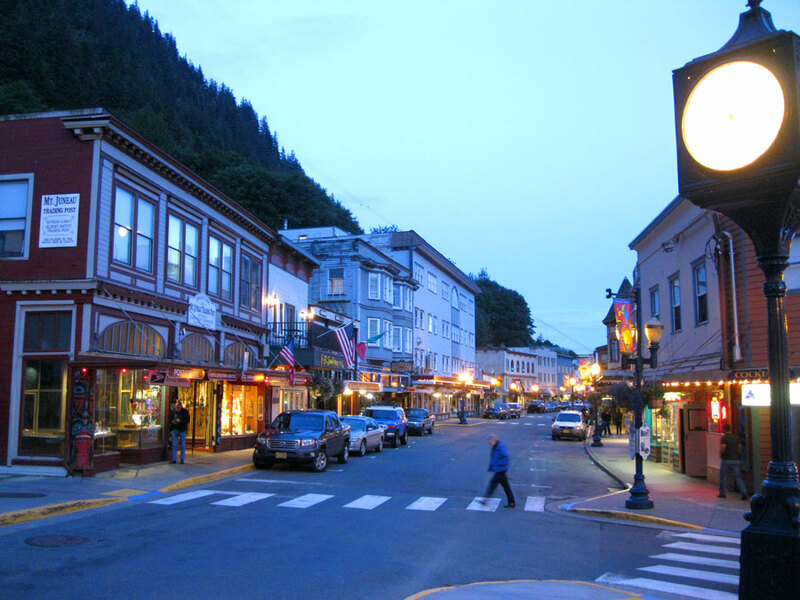 Juneau has been the political center since 1906 when the territorial capital was moved from Sitka. Since statehood in 1959 it has survived multiple attempts to move the government to “mainland” Alaska nearer the majority of the state’s population, but for the time being its status appears to be safe. The ferry terminal is located about 10 miles north of downtown Juneau, as is the airport, so a cab or shuttle is necessary to get to the center of town. Our hotel, the Driftwood Lodge offered a free shuttle with a cranky driver who got us there in one piece, if just barely. The hotel is centrally located for walking to any destination in downtown Juneau and had the best wifi signal we’d experienced in a couple weeks. The room was a two bedroom suite with a living room and mini kitchen, and for people who have been fishing they offer freezer space, because apparently that’s a common requirement in Alaska. Much of the main drag along Franklin Street is unfortunately devoted to the typical souvenir and jewelry shops catering to cruise ship passengers’ style. We found that by staying just a few blocks farther north and slightly uphill, we lost that crowd and were able to find some great local dining options. We had a wonderful dinner at the upscale restaurant Salt that specializes in creative Alaskan cuisine. They were even featured recently on the show Brew Dogs for their quality beer list. Another great dinner experience was Rookery Cafe, with a more casual atmosphere, but equally unique food. They also get bonus points for having an awesome logo. For pastries and coffee in the morning the locally-loved Heritage Coffee (5 locations around town) hit the spot. In the evening the historic Alaskan Hotel and Bar was a popular watering hole for locals and tourists alike. It has made several appearances on Esquire’s “Best Bars in America” list for its live music, fascinating clientele and Victorian era decorating. It’s a nice dose of authenticity on a stretch of Franklin Street more dedicated to selling tchotchkes. 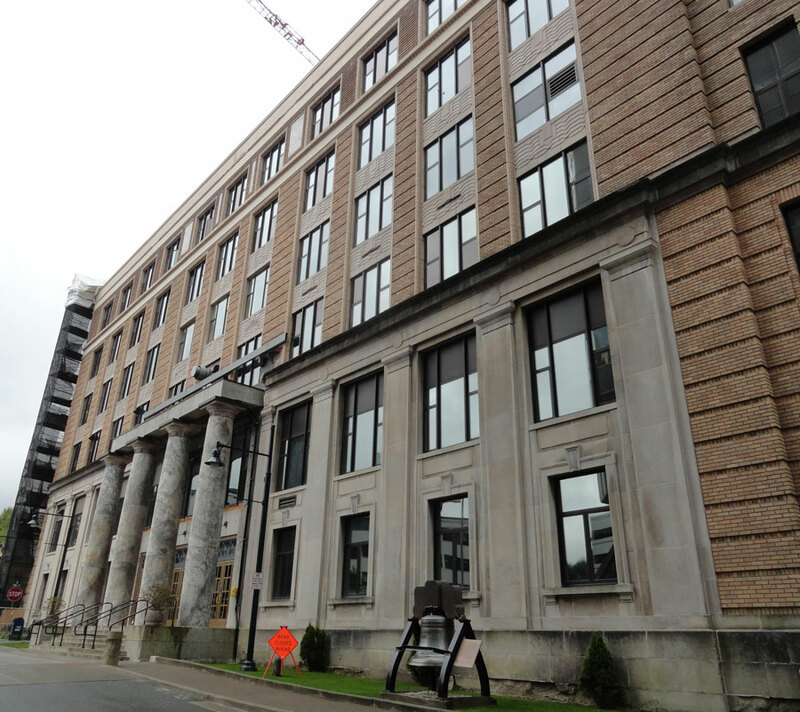 Alaska’s state capitol is currently undergoing renovation. One morning we stopped by the state capitol building to have a look. The building was built in 1929 as a territorial office building and became state capitol in 1959. It’s non-traditional by American standards because unlike most state capitols it has no dome. It is basically a six story office building with Art Deco detailing. In typical Alaskan fashion there was no line, no security check and no metal detectors. A friendly young man offered us a tour and immediately took us upstairs to begin. We learned a lot of additional facts about the state and its history and were even able to step right into the House of Representatives chamber. It was rather quiet that day as the legislature is only in session from January through April (Alaskans are busy people). One interesting governmental fact we learned is that their representatives are required by law to vote for bills with a yes or a no. If a lawmaker tries to skip out on a vote, they send the state troopers after them. They don’t mess around. Looking down toward Gastineau Channel from the Mt. Roberts Trail. 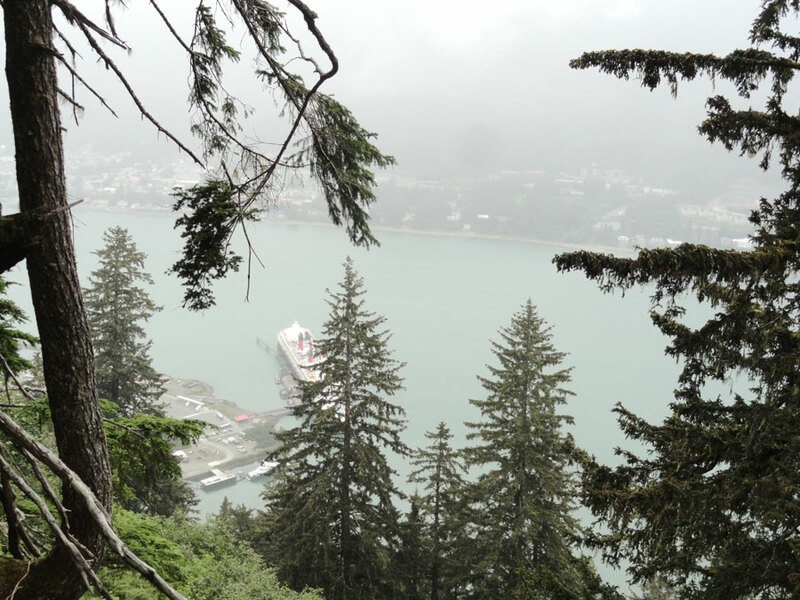 One of the busiest tourist attractions in Juneau is the Mt. Roberts Tramway located just south of the downtown area near the cruise ship docks. The tramway was completed in 1996 and takes visitors to an overlook 1,800 feet above the city on one of the most vertical cable tramways in the world. At the top is a restaurant, nature center, gift shop and a theater showing a movie on native Tlingit culture. Naturally, we don’t like to do things the easy way, so we decided that instead of paying $32 to ride up in comfort, we’d hike up the steep Mt. Roberts Trail instead. One minute you’re walking down a city street, the next you’re climbing a mountain, it’s pretty cool. We enjoyed lunch at the Timberline Grill at the top, watched the movie and did a little hiking on the trails at the top. As a bonus, we got a free ride down on the tram after showing our lunch receipt to the operators. Back at sea level we wandered toward the hotel, but were distracted by the Alaskan Brewing store. We stopped in thinking maybe we could sample some brews there, but it is only a gift shop and not a bar. Luckily, we had arrived just in time to be sold a shuttle ride to the actual brewery in the Mendenhall Valley area of town. A white van simply marked “Liquid Alaska Tours” dropped us off and the driver said he’d be back for us in an hour and a half. To be honest, we’d probably get into any unmarked white van if there was a promise of beer at the other end. The tour was laid back and mostly consisted of an intro video and an employee describing the beers and filling our glasses with samples. If you are in Alaska or if you’re lucky enough to live in a state where they sell it, get your hands on an Alaskan Smoked Porter; it’ll change your life. So that was our time in Alaska’s capital city. It always comes down to beer, doesn’t it? Early the next morning we were scheduled to board the Malaspina ferry for our trip up to Skagway, Gateway to the Klondike Gold Rush. This entry was posted in Destinations, Travel Resources and tagged alaska state capitol, Alaskan Brewing, Alaskan Hotel and Bar, Driftwood Lodge Juneau, Glacier Bay Lodge, Glacier Bay National Park, Johns Hopkins Glacier, Juneau, Mt. Roberts Tramway, Rookery Cafe Juneau, salt juneau. Bookmark the permalink.